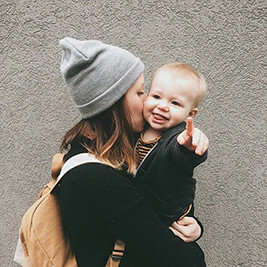 vanilla & lace: Lipstick: My top 5 favorites! 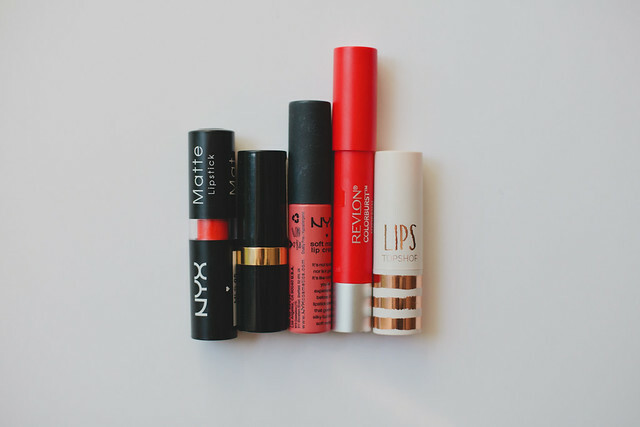 Lipstick: My top 5 favorites! 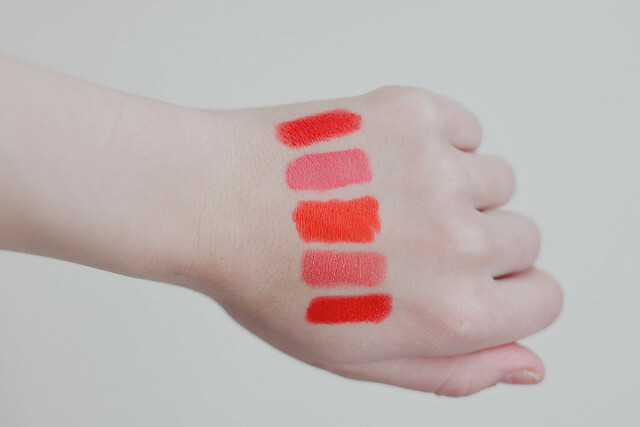 I've developed quite a knack for lipstick these days. I could literally spend an hour of every trip to Target looking up and down the cosmetic aisle for a lipstick that will be my next victim (AKA get worn obsessively). I don't really branch out though, I tend to stick to the coral/orange/red vibe... all in the matte variety and I don't stray from it. Not kidding, I don't have any pinks/nudes/etc or any glossy lipstick. Change is hard. But since I do only use ones in this color palette I know the shades well and have returned many I didn't like and have thus narrowed down my favorite five! For right now, at least. 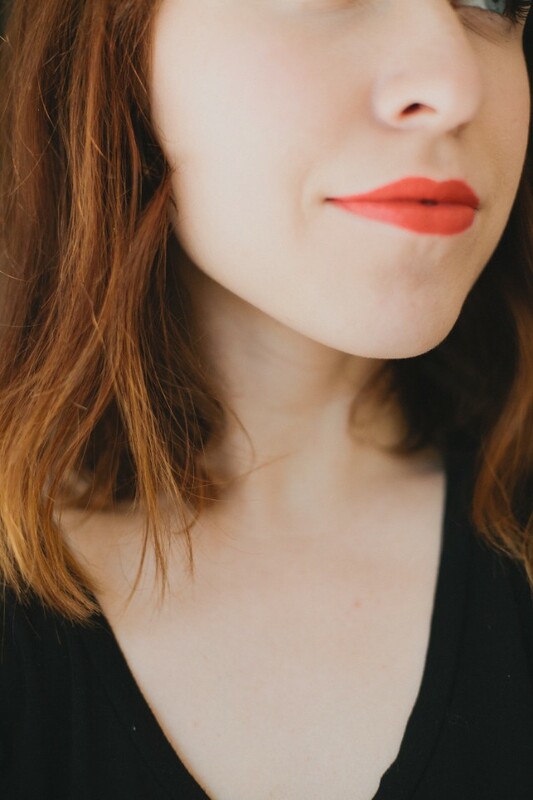 NYX soft matte lip balm in Antwerp - I love this formula so much! The color doesn't fade, it feels like nothing is on your lips and it smells like cupcakes. I have a few other colors (the orange and red ones) and I love them all. Revlon color burst in Striking spectaculaire - This was a recent find and I'm totally obsessed with it. It feels AMAZING on your lips (and its minty) and it doesn't get dry or bleed. This is my favorite true red. Topshop matte in Rio rio - I randomly picked this one up when I was in NY and it instantly shot to the top of my list of favorites. The color is amaaaazing and its buttery but matte. Definitely worth ordering if you're not near Topshop. There you have it! All of these are drugstore lipsticks with the exception of the topshop one and can be bought for $6-$7... which is right up my alley! And since I'm always looking for new ones, do you have any suggestions for me to try? I have nyx indie flick and I love it! but have not worn it in a while since I only wear it during the summer and stick to reds the rest of the year, will have to dig it out! I will have to try that nyx lip balm though! 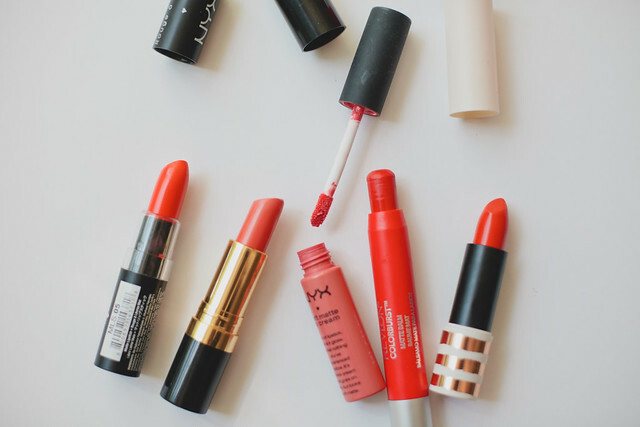 im a orangey lipstick girl too. so love these. question - which one are you wearing in the above pic? it looks perfect. Ohhhh I'm in love with all of these colors, I gotta stray some from my usual red! Oh my gosh the two NYX ones!!! Gorgeous colours.